I am back from the land of the dead. And, now that I have risen from the plague that struck me down, I can properly give some love to the Less Than Three Campaign that started this week. This sprung up from David Haydn-Jones and all proceeds are being donated to The Alzheimer’s Foundation of America. Things like this are another reason I love the Supernatural cast, and by extension their fans. They are all so invested in trying to make the world a better place, and it is really inspiring to not try and emulate that in your own life. I know that not everyone can create a fundraiser like this, but it still inspires me to do all the little things I can to make the world a happier or easier place for someone else. He is joining the ranks of Jared, Jensen, and Misha, all 3 who have raised money for depression and setting up a crisis hotline. It’s a great list of people to be included with. The amount of lives these 4, and many others from this show has touched is astounding. So, you may be wondering how this all started or why it has such a unique name. For all the flaws that sometime come with social media, sometimes magical things can happen from it. As David explains on the campaigns page, it all started with a twitter Faux Pas. A self confessed twitter noob, whenever someone sent him a <3, which symbolized a heart, he took it literally and thought we were rating him as “Less than Three.” Luckily he realized he wasn’t being trolled and was instead this was a very positive thing, and much hilarity between him and his fans ensued. campaign was born. David decided to channel the generosity of his fans and raise awareness for a disease that he feels very strongly about. Having personal experience with it himself, in watching how his family banded together to care for his Nana stricken with the disease, he knows exactly how hard it can be for families to deal with. This is clearly something he is very passionate about, and that is resonating strongly with his fans. They are rallying behind him and pushing as hard as they can to see this campaign succeed. The Alzheimer’s Foundation of America’s (AFA) mission is to provide optimal care and services to individuals living with Alzheimer’s disease. It also is there to provide support to their families and caregivers. There is also a staff of licensed social workers ready to assist anyone in need. Over 2,800 organizations across the nation are committed to their mission. Such services are critical as the disease continues to grow. The website itself has a full page just full of links for information. Also how to deal with literally any situation you can think of occurring. For anyone that may be struggling out there this is a great website to go to. And I love that David stands behind it and is bringing it to the attention of people who may not have known about it. It seems like a great organization, so I hope to see this campaign succeed. Dealing with Alzheimer’s on your own is so hard to do, so knowing there are places like this that people can access is such a blessing. Like I mentioned at the beginning of this piece, this cast has become an inspiration to so many people. 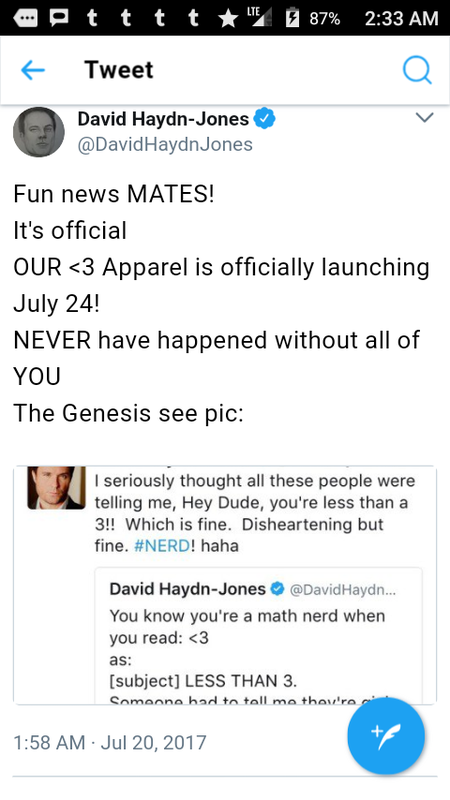 In the case of the Less Than Three campaign though, this really has felt like a labor of love from both David and his multitudes of fans on twitter. He has included everyone in every step of the creation of this campaign on twitter. He takes the time daily to answer fan questions about the campaign, sharing designs and sketches, making it personal to everyone involved. Stories were shared between David and his fans about struggling with family members who have suffered from this disease. To see people open up with each other and receive support in an age where so much of social media is negative, was utterly refreshing to witness. It was very heartwarming to see people come together to fight for something so wonderful, and to feel included by someone who could easily have brushed us all aside. So, a big thanks to David Haydn-Jones for being an inspiration to us all, and good luck in your campaign. If your fans have any say in it, it will succeed beyond anything you hoped for. For those interested, the link to support the Less Than Three campaign is David Haydn-Jones’ “<3 = Love” Tee.